Posted November 24, 2018 by Josette Farrell in Features. Déanfaidh an Oifig Taighde, laistigh d’Ollscoil na hÉireann, Gaillimh, plean teanga seacht mbliana (2019-2026) a ullmhú agus a sheachadadh do Chathair na Gaillimhe. Sna míonna amach romhainn, beidh an Dr John Walsh, Roinn na Gaeilge agus an Dr Dorothy Ní Uigín, Acadamh na hOllscolaíochta Gaeilge i gceannas ar fhoireann saineolaithe sa phleanáil teanga chun an plean a fhorbairt don Chathair. Is é cuspóir phlean teanga Chathair na Gaillimhe, de réir pholasaí an Rialtais, cur le húsáid agus eolas cumarsáide na Gaeilge mar theanga pobail i gCathair na Gaillimhe ar bhonn incriminteach. Bhunaigh Comhairle Cathrach na Gaillimhe agus Gaillimh le Gaeilge coiste stiúrtha nua (Coiste Stiúrtha Pleanála Teanga Gaillimh (CSPT Gaillimh) le tacú le agus treoir a thabhairt d’ullmhú agus seachadadh plean teanga do Chathair na Gaillimhe. Tá ionadaíocht ar an gCoiste ó na hearnálacha poiblí, príobháideacha, pobail agus deonacha i gCathair na Gaillimhe. Tá an Dr John Walsh ina Léachtóir Sinsearach le Gaeilge i Scoil na dTeangacha, na Litríochtaí & na gCultúr. Múineann sé an tsochtheangeolaíocht ag leibhéal na bunchéime agus na hiarchéime. Tá an Dr Dorothy Ní Uigín ag feidhmiú mar Phríomhfheidhmeannach Acadamh na hOllscolaíochta Gaeilge, in Ollscoil na hÉireann, Gaillimh. Tá spéis faoi leith aici i dteagasc agus sealbhú teanga. Tá an Tionscadal Gaeilge seo á chomhmhaoiniú ag Foras na Gaeilge tríd an Roinn Cultúir, Oidhreachta agus Gaeltachta agus Comhairle Cathrach na Gaillimhe. The Research Office within the National University of Ireland, Galway will prepare and deliver a seven year Irish Language Plan for Galway City 2019-2026. Dr John Walsh, Roinn na Gaeilge and Dr Dorothy Ní Uigín, Acadamh na hOllscolaíochta Gaeilge, will lead a team of experts in language planning over the next few months to develop the Plan for the City. 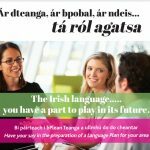 The objective of the Irish Language Plan, in line with Government policy, is to increase on an incremental basis, the communicative use and knowledge of Irish in Galway city as a community language. A new steering Group, Coiste Stiúrtha Pleanála Teanga Gaillimh (CSPT Gaillimh), was jointly established by Gaillimh le Gaeilge and Galway City Council to support, guide and oversee the progress and the delivery of an Irish Language Plan for the city. Members of the Coiste represent a broad cross-section of the public, private, community and voluntary sectors in Galway city. Dr John Walsh is a Senior Lecturer in Irish at the School of Languages, Literatures and Cultures, specialising in sociolinguistics. Dr Dorothy Ní Uigín, is Acting CEO of Acadamh na hOllscolaíochta Gaeilge, at the National University of Ireland, Galway. She is interested in language teaching and acquisition.